Paris. Rue Mouffetard, place Monge. Parks succeed one another: open, majestic and well- planned, or thickly grin, mysterious. Perennial trees rise up over pedestriansʼ heads. Children, in thousands, run around, trip and skin their shoulders and their knees, then rise again, and swings and sand pits flash first red then green then blue, yellow, orange, white, from their unbuttoned polos. Middle-aged men with glasses, neatly combed, stoop over their round bellies to throw boules; when the tall, strapping African wins, they spit on the ground and invite him to a revanche. Birds nest in the dark corners of the impressionistic foliage in the Arènes de Lutèce. Students and tourists fall asleep on the olivecolored metal chairs in the Jardins du Luxembourg, ipods on free display, slap happy, debonair, like birds and statues. And in between the parks, the streets are filled with sea aromas, the smell of crabs and oysters, mussels and prawns, spread ostentatiously on thick, crushed ice, ready to be sucked, succulent and fresh, by the blooming lips and tongues of young men (children no more, not yet mature) strolling along, smelling of soap. Dressed in their T-shirts and their sandals, they smile broadly as they pass you by, not lewdly, not neglecting, just right; their veins full of life and ease. Suddenly, the smell of lacquered glaze or oil-paint solvent (“Atelier/Librairie Editions Galle): a middle-aged, stylish man, in dark-blue blazer, unlocks the door on his way in. In the vitrine pieces of tawny carton conceal everything. Only a single volume stands at attention on a book-easel: Blaise Cendrars, catalogue of works. The door closes behind him, sucking the lacquered smell far deep in the interior. - A tall, young man with full lips, lips begging to be bit, and sparse little silver hairs among his beard. - Two girls who love each other. - Two tots and a father on wooden scooters. - An obese 40-year old whirling his coffee in a bistrot, solving crosswords and waiting for the results of the horse-races. - A freshly bathed clochard with a mild gaze turned to the sky, all smiles. - Bee keepers moving so slowly they look like figures made of wax. Fathers and their smells everywhere: one coming out of the public baths with his 4 year old daughter, hand in hand, their hair glistening, their skin smelling of chlorine; others, around 30 years old, playing football with their sons and their sonsʼ friends in the Observatoire, their skin glowing with health and summer: an innocent boysʼ world. And I know that when our middle-aged gentleman returns home at night, father of books and crafts, he will be nothing more but the smell of his paints and prints and lacquered glazes –sour and creative. Thatʼs what his wife will lie with tonight. 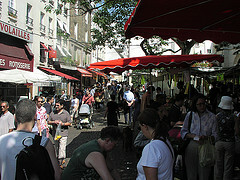 Image: "Paris Rue Mouffetard Market" by Andrew Nash.